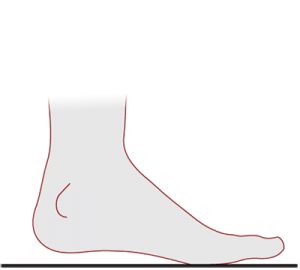 How the foot lands is very different when running barefoot. 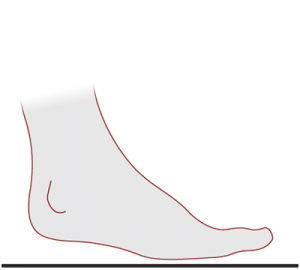 In shoes the stride is long and the leg extends the foot forward of the knee, landing heel first. 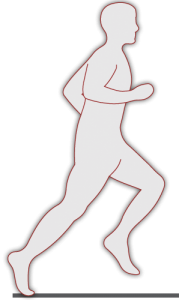 Barefoot the stride is shorter, the leg extends the foot only just beyond the knee, with the forefoot touching down behind the knee, as it moves backwards matching the ground speed just before touchdown. It’s all about how the foot touches down. 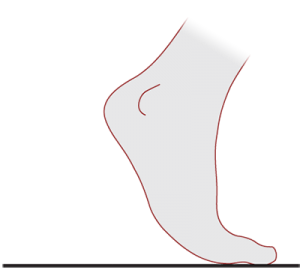 The techniques shown on this site will tend to talk about the front or mid foot landing first, followed by the heel. This is the correct way to learn. However as you perfect the technique, you’ll naturally find yourself landing with a flatter and flatter foot, until it may appear to you that you’re landing with a completely flat foot. This is achieved by learning to bend your knees more, using your legs as the spring to dampen your landing. You shouldn’t worry too much about the technique, as everyone will run slightly differently. As long as you start with our pointers, you will naturally fall into your own style. Without the cushioning of running shoes, you will naturally run in the most comfortable manner, which is the correct and natural manner. Also bear in mind that terrain and speed will also effect how your foot lands. The faster you run the further forward on the foot you’ll land, the softer the surface you run on, the further back on your foot you’ll land. For example, even veteran barefoot runners will effectively heel strike on soft sand. Your body is looking for stability and so will land harder on softer surfaces. Which is why harder surfaces are better for beginners honing their technique. An easy way to understand barefoot running is to simplify the movement into different gears. 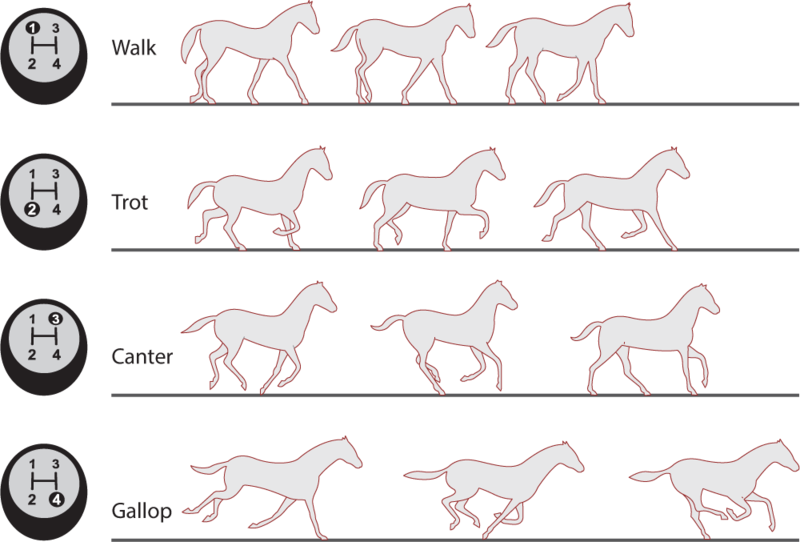 We have several distinct ways of moving, depending on our speed. If we imagine these different forms of locomotion as gears, we need to be in different gears depending on our speed. Let’s look at a horse as an example. 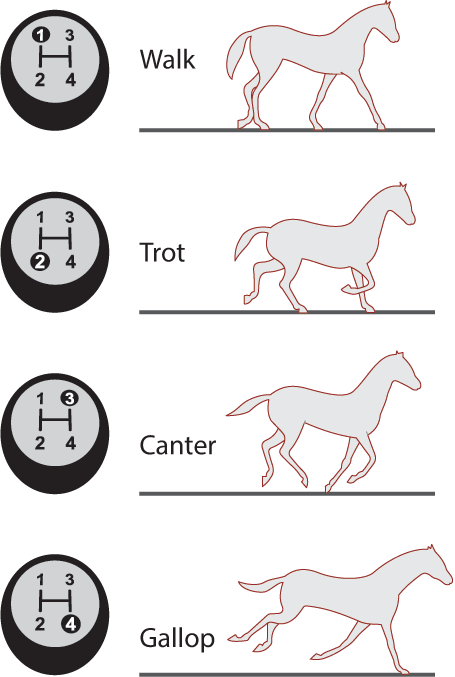 A horse has 4 gears: walk, trot, canter and gallop. It turns out that horses suffer problems from their shoes as well. A human has 3 gears, walk, run, sprint. Walk – Heel to toe ground contact, force through foot = 1 x bodyweight. As your speed increases the force experienced through the heel increases to 2 x bodyweight. 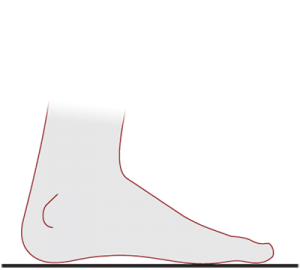 At this point it becomes uncomfortable on the heel, which is the cue to change gear up to a run. 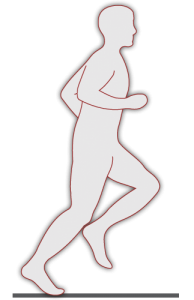 Run – Forefoot to heel ground contact, force through foot = 2 x bodyweight. 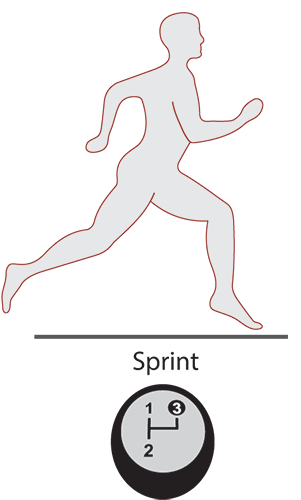 As speed increases towards 3 x bodyweight, the propriosensory feedback from the foot tells the body to shift gear again up to a sprint. 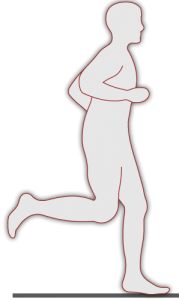 Sprint – Similar motion to running but with the landing point shifted slightly forwards of the ball of the foot. Heel doesn’t touch down at all. Can only be sustained for short bursts. Your body knows when to change gear because of the feedback it gets from your feet. This system is called the proprioceptive system. It relies on the fact that it becomes uncomfortable or even painful to continue to use 1st gear, the walking gait, beyond a speed that generates 2 times your body weight. 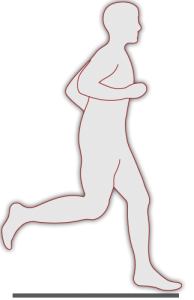 When the force on your foot approaches twice your body weight, the brain tells the body to shift up a gear and adopts the 2nd gear, the running gait. Unless of course something stops that signal. Like for example, you’ve placed multiple layers of padding (a cushioned running shoe) between your foot and the ground. Extra padding that blocks the discomfort through your heel that is the signal to change gear at 2 body weights (or more). Well, nothing happens then. You continue to use 1st gear. Not only are your strides longer, you are now generating a force of 2-3 times your own body weight through your heels. Only you’re blind to this fact, as the padding in your shoes have converted the mechanical contact pain you would have felt, into a kinetic shock wave that travels up your leg unnoticed. 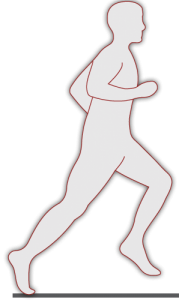 There is a name for this unnatural form of human locomotion, it’s called Jogging. Jog – Heel to toe ground contact, force through foot = 2-3 x bodyweight. This extra force is not absorbed by cushioned running shoes, they just mask it at the point of impact. Cushioned running shoes allow this force to be sent up your legs and be taken by your ankles, knees, hips, spine, etc. None of which was designed to take this punishment. However the result of this punishment is only noticeable after hundreds or thousands of repetitions. Ever wonder why your knees ache after a long run? 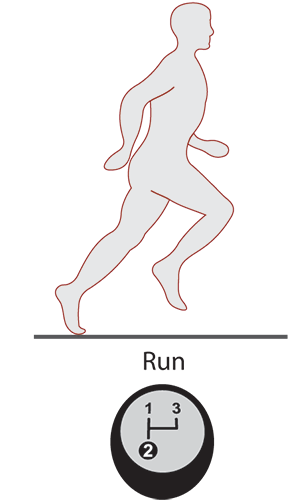 Running with an average cadence of 180 is over 5000 impacts each leg per hour. 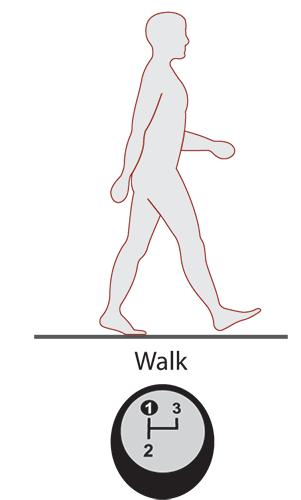 With barefoot running, although the overall ground weight is still the same, it’s absorbed through the whole of the flattened foot and the motion of the foot and legs in the way we evolved for it to work. Our feet and legs were designed to absorb the weight using any of our 3 gears, they weren’t made for absorbing the shock that comes with the unnatural gait of jogging. to move or shake with a push or jerk. to move with a jolting rhythm. to align the edges of stacked paper by striking against a flat surface. 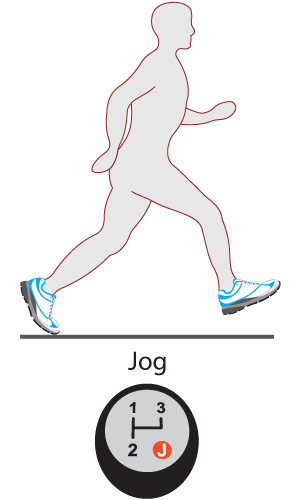 to run at a leisurely, slow pace, especially as an outdoor exercise. Next Page: What's the catch? Too Long; Didn't Read? Try the concise version instead.